Wienks' top seller, WCR Commissioner 593 P, was worth $50,000 to Elder Charolais of Coronach, Saskatchewan, Can., Kay-R Charolais of Waskatenau, Alberta, Can., and Wilgenbusch Charolais of Halbrite, Saskatchewan, Can. Location: At the ranch in Lake Preston, S.D. 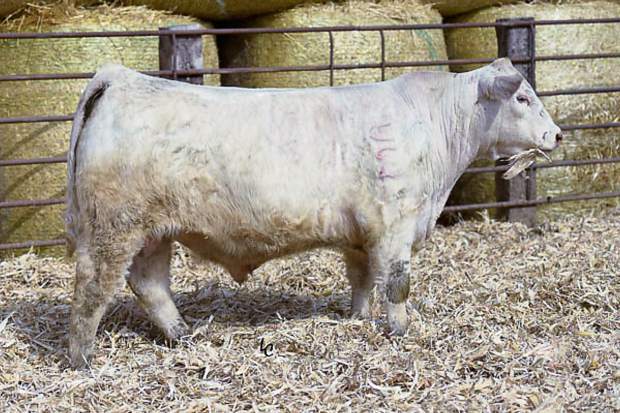 Top seller for Arnold and Carol Wienk was lot #1, WCR Commissioner 593 P, a February 2015 son of WCR County Line 3132 P, for $50,000 bought by Elder Charolais of Coronach, Saskatchewan, Can., Kay-R Charolais of Waskatenau, Alberta, Can., and Wilgenbusch Charolais of Halbrite, Saskatchewan, Can. This bull had an adjusted weaning weight of 775, an adjusted yearling weight of 1,317, and EPDs of BW -4.4, WW 44, YW 79, Milk 13, TM 35, SC 0.9, CW 27, REA 0.26, FAT 0.022, Marb 0.52, TSI 221.21. Next top seller was lot #2, WCR Sir County Line 5125 P, a February 2015 son of WCR County Line 3132 P, for $17,000 bought by Prairie Valley Charolais of Platte, S.D. This bull had an adjusted weaning weight of 846, an adjusted yearling weight of 1,313, and EPDs of BW -2.0, WW 46, YW 72, Milk 12, TM 35, SC 0.7, CW 23, REA 0.43, FAT 0.022, Marb -0.05, TSI 208.40. Third top selling lot was #3, WCR Sir County Line 5187 P, a February 2015 son of WCR County Line 3132 P, for $15,000 bought by Stout Charolais of Kadoka, South Dakota. This bull had an adjusted weaning weight of 847, an adjusted yearling weight of 1,373, and EPDs of BW -1.0, WW 54, YW 93, Milk 9, TM 36, SC 1.3, CW 31, REA 0.44, FAT 0.023, Marb 0.02, TSI 230.17. Lot #4, WCR Sir County Line 551 P, a February 2015 son of WCR County Line 3132 P, for $14,000 bought by Keahay Charolais of Grove Hill, Ala. This bull had an adjusted weaning weight of 784, an adjusted yearling weight of 1,301, and EPDs of BW -0.5, WW 49, YW 82, Milk 9, TM 33, SC 1.3, CW 25, REA 0.32, FAT 0.015, Marb 0.01, TSI 218.38. Rounding out the top sellers was lot #13 WCR Sir Kingsbury 5214 P, a February 2015 son of WCR Kingsbury 116P, for $12,000 bought by Schimdt Cattle Co. of Gordon, Nebraska. This bull had an adjusted weaning weight of 860, an adjusted yearling weight of 1,432, and EPDs of BW 0.1, WW 49, YW 83, Milk12, TM 37, SC 0.7, CW 39, REA 0.33, FAT 0.033, Marb -0.02, TSI 216.52.